I’m feeling a little panicky … Easter will be here in two weeks! How do these things sneak up on me … do you feel the same way? I have sooooo many plans … never enough time! 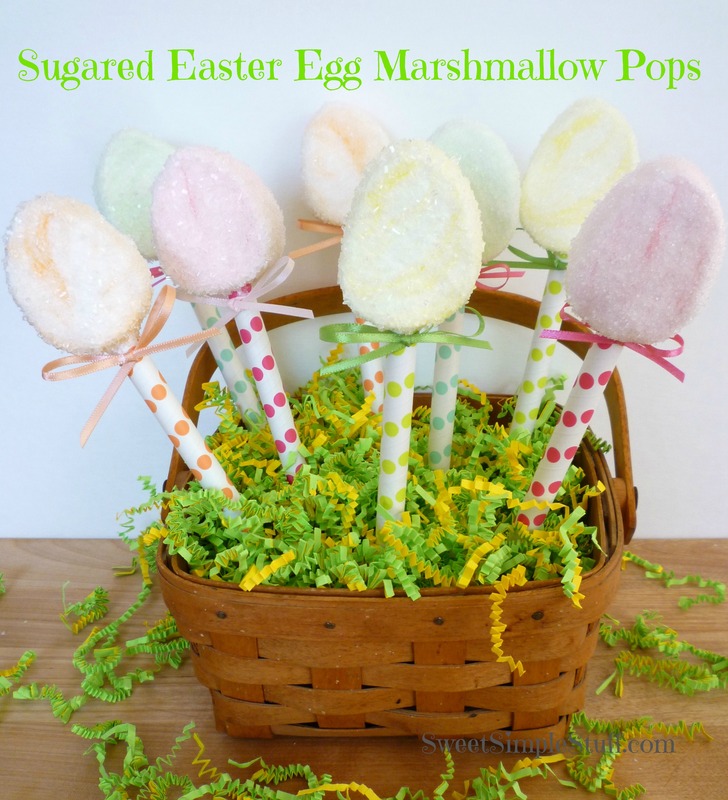 Today I made these quick and easy pops for you … I hope you like them! I found the marshmallows at Walmart … called EggSwirlers made by Campfire. They are fruit flavored, shaped like eggs and colored! 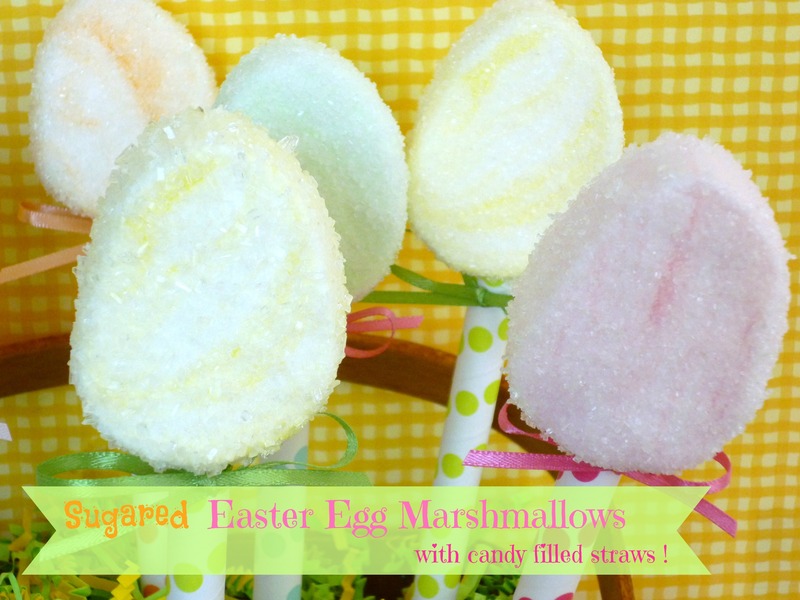 The straws came from Target (in the Easter section). They are 7-3/4″(19.6 cm) x 3/8″ (9.5mm) … longer than the ones I used at Valentine’s Day and hold more candy!!! I used clear/white sanding sugar and crystal sugar … because I like both and couldn’t decide 😉 Either one works great. Flatten one end (about 1/2″) of a straw. Dip a steak knife in water and stick it into the bottom of the marshmallow to create an opening for the straw … insert straw. 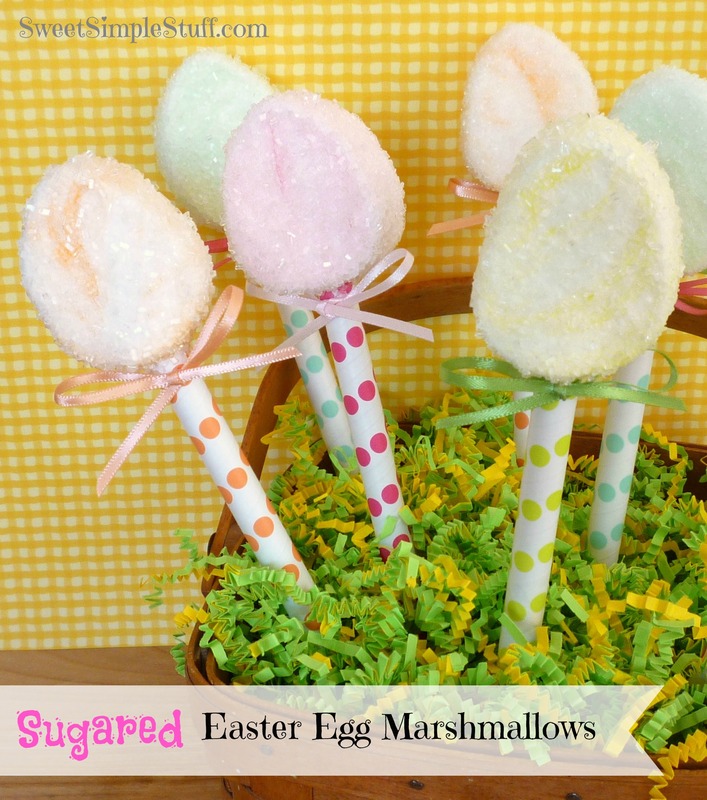 Dip the marshmallow in water and use a paper towel to wipe off excess water. Cover the marshmallow with sugar and allow to dry. I’m not sure what it says about my (dull?) life – but I just get the biggest kick out of your creations! And since I am w/out a kitchen for the next six (?) weeks – this is do-able for me! So darn cute! I am a broken record – you are such a blessing! Thank you for sharing your gift of creativity – and so much more – great photos, great instruction – you make it look easy and I know it’s not! Happy Easter!! You should go into business. You have the cutest sweetest ideas. I bet they taste just like those little sugar chicks. :} I think the older we get, the faster the days go by. Always have so much to do and sooooooo little time. I just love the clever ideas that you come up with. I saw them packaged marshmallows at Wal-Mart and didn’t get any and now I’m kicking (not hard mind you) myself for it. Them peeps are just a bit 2 sweet 4 me. Well, until next time; may you have a great weekend. Easy and so festive – love it. At first glance I thought you’d have to shape the marshmallows. But no….Walmart to the rescue. Be sure to tell recipients there are candies in the (Target) straw. Brenda, I just know if I grow out of all my clothes, it’s going to be your fault! So cute! And I know, I need to make more Easter treats but where is all the time???? ?